College Football Recruiting Process for Kickers: Which University Kicking Camps Should I Attend? Coach Brent explains which University Kicking Camps you should attend and what you can do to gain more traction in the college football recruiting process. Which University Kicking Camps Should I Attend? Some kicking camp companies help run (along with the University staff) different college kicking camps. Kicking World never got involved in the University kicking camps due to our own demanding camp schedule; we simply have not had the time, although we would like to do it in the future. Regardless, over the years we (as have our campers) received lots of literature, marketing and contact from college football programs ‘inviting’ our students to specific University kicking camps. I will debunk some of the unclear information to help educate you on the college recruiting process, what’s involved, which camps to choose, and to ultimately help save you some money and put your son on the right track in his college football recruiting efforts. I put the word ‘invitations’ in single quotes to denote the fact that many times an invitation is merely a word some schools and camps use to make their note to you appear more selective. Unfortunately the word is over-used in the athletic camp space/college football recruiting industry and kids’ egos get blown up making them think they are more talented than they really are because of all of these ‘invites’ they receive. The reality is, very few of these invites are authentic, in the sense that the Coach hand selected you and truly wants to see you at camp. Most of the time, an invitation simply means they are informing you of the event and they hope to generate as much interest as possible and get as many campers there as possible. Why? 1. It generates revenue, 2. It makes the University look good for recruiting purposes (a big draw gets people interested in the program), and 3. It gets more athletes in front of the coaches and broadens their recruiting pool. Many college football teams will not offer a recruit unless they see him perform in-person. Performing well in front of coaches in a pressured camp environment can really garner a football program’s interest in you quickly. Many times the University kicking camp is really a ‘legal tryout’ for you. Coaches get e-mailed YouTube and Hudl videos and profile links all day long and many times they want to help make their recruiting efforts more efficient and just get as many kids as possible to their University camp to use it as a mechanism for finding their next kicker, punter or snapper. So if you perform exceptionally well at one of these college kicking camps, you could very well find yourself on their radar, or even sometimes receive an offer on the spot (exciting)! To help increase your chances of ‘being seen’ at the camp, before the actual camp, it’s a great idea to e-mail the correct coaches (we discuss who they are and how to find their info at our kicking camps) introducing yourself and telling them how you’re excited to show them your ability. Don’t forget to include a good in-season and practice highlight video (see my article on Tips for Making a Kicking Highlight Video) along with your contact information! Perhaps the coach reviews your e-mail and likes your highlight video and what you had to say; he might add a note next to your name on the camp roster to keep an eye out for you! What is the benefit of going to a University kicking camp? The major benefit is that you will have the opportunity to perform in front of (most of the time) the college football coaches who are actively involved in the recruiting process of their specialists. So if you do well in front of a coach who is a decision maker, you could find yourself getting on their radar and possibly earning a scholarship. But realize at some of these camps, there are 100-200 students which means you need to do exceptionally well – think #1 or #2 overall camper in any one skill (FG, KO, P) to gain interest from the staff. Is my son too young to attend a college kicking camp? Typically college football programs will not start recruiting kickers/punters until around their sophomore year. 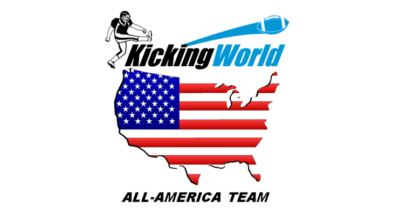 We talk a little more about this at Kicking World camps as far as when you should start getting your name out there and what to do year by year, but the short answer is I would recommend you go to a college kicking camp if you are a junior or senior in HS, or if you are an exceptional level kicker as a sophomore. If you’re a frosh or below, your time horizon is so far away they are not even looking yet in your class. Also the coaches know most kickers don’t fully develop until after their junior year of HS. A college football coach would rather wait a little longer to find the right specialist with the biggest/most accurate leg they can find. Most college football coaches won’t recruit on ‘potential’ for a kicker like they would a 9th grade running back who can run a 4.4 and already weighs 200 lbs. It’s just a different position and most of the time it is a longer tail cycle to determine which kicker or punter they will choose and which class year they are going to need. If you’re looking at schools with big D1 football programs, an ideal situation for you (and the team) is to have a senior kicker as you enter your freshman year. Typically schools will have you ‘study’ underneath the starting kicker, allow a year for you to grow, mature, get some credits under your belt and become even better in anticipation of you earning the job the following season after the current kicker graduates. Many times you will redshirt your freshman year (not use up any athletic eligibility) and then your sophomore (academic) year, which would be your ‘redshirt freshman’ year of football, you would start playing and begin your 4 years of athletic eligibility. This is very common with big football schools and has happened quite often with Kicking World students, although some do end up beating out the competition and taking over duties as a true freshman. My son received an invitation from XYZ University to attend their summer kicking camp. Or, my son received an invitation from XYZ Kicking Camp to attend their Showcase. Should we go? How do we know if they’re really interested in me or if it’s just another mass invite? Does the ‘invitation’ start with something to the extent of: Dear Recruit, Dear Prospect, Future Athlete, etc.? Is it typed and does it sound generic? If so, most likely it’s a mass invitation. We at Kicking World send out real invitations each year about our Showcase event in San Diego. We literally hand pick students for this based on performance at our camps and less than a couple hundred of the over 1500 students we see a year get this special invite. Unfortunately many other camps ‘invite’ everyone and it is really just an attempt to get as many kids to camp as possible (make more money/create a bigger camp). Some University kicking camps do the same so it’s important to weed through them and realize you can’t go to every camp, and you need to be selective. How should we determine which University kicking camps to attend? Most families will need to focus on 2 to 3 ‘best match for me’ camps to attend. You cannot expect your parents to drive and fly you across the country and show up at 10 different camps; it’s just not reasonable nor feasible financially and logistically. I would start by focusing on schools’ camps who seem more genuinely interested in you and who have an actual need in your class year. Remember what we discussed earlier about looking for a Senior when you enter as a freshman – that is ideal at larger football schools. Perhaps you have some e-mail communication with a coach and you two begin to chat more and more, that might be a camp you should attend because there’s some obvious interest there. You might get a ‘wow!’ school out of the blue like Alabama or USC send you a camp invitation, but realize the chances of making a dent at a school like that without having previous contact is extremely difficult. If you’re actively being recruited by them and/or had some legitimate communications with the coach, (more than just a ‘Hi, attend our camp’) kind of e-mail, then go for it! But make sure you weigh all your options and maybe pick 2 or 3 realistic schools and throw in that wild card one to see what you’re made of! Be sure whichever schools’s kicking camps you think about signing up for, that you have the grades and test scores to get into the school; otherwise you are wasting your time and your parents’ money! It’s so important to keep your grades up and do whatever you can to maximize your test scores – sometimes a door may open for you and shut for another recruit because you got a few more points higher on your ACT and your GPA was significantly better. In a coach’s eye, good grades/scores = less headaches of wondering if you will ‘make it’ in college! Another good strategy is to try to attend a few different camps from different conferences. I just feel if you can do well at a couple different camps from different conferences – say a Big XXII school, a PAC 12 school, an ACC school and a Big East school (for example), your name spreads more across different circles and people might start hearing about you faster versus only attending 2 camps from schools near each other in the same conference. Think about all the different college football recruiting services like ESPN, Max Preps, etc. They all have regional writers/reporters. If you can really dominate at camp and someone hears about it, they might report on you and broaden your ‘hot factor’ across the recruiting circles. You may do so well that even other schools hear about it and start showing interest in you. College Football Recruiting, particularly to kickers, punters and snappers is a detailed process with so many parts to it. Attending University kicking camps is just one small prong on your ‘To Do List’ as a college football recruit. You should also make an investment in training with a private kicking coach, attending instructional kicking camps to improve your form, have a good camera to record you or your son’s games and be spending a lot of time proactively contacting schools and coaches. Whatever you do, it all comes down to performing in the game. You can spend all the time in the world on ‘recruiting’ but you need to be reliable under pressure and have solid game film and statistics to prove your ability. Above all with this recruiting talk, put your emphasis on being the best kicker, punter or snapper you can be and help your team win more games!